The Newfoundland wolf subspecies was not formally described until 1937 by zooligists G. M. Allen and Thomas Barbour, after it had already been led to extinction. Its scientific name Canis lupus beothucus was taken from the Beothuck, the native inhabitants of Newfoundland who were officially declared extinct by 1829. The Newfoundland wolf lived on the island of Newfoundland off the east coast of Canada. 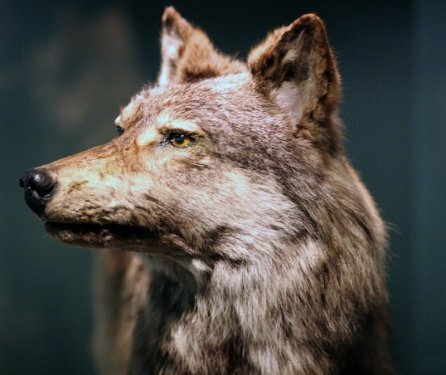 Recent evidence has suggested that the first wolves to inhabit the island may have been there prior to the last ice age, surviving the ice age in refugia, south of the glacial ice sheet. The Newfoundland wolf was a medium to large wolf up to 5.5 feet long (nose to end of tail) and up to 100 pounds. It was said to be white, with a black stripe down its spine. Caribou was the principle diet of the Newfoundland wolf. It also fed on beaver, vole, and other Rodentia. Although hunting, trapping, and vigorous predator control methods were used on the Newfoundland wolf, it is believed to have been led to extinction mainly by a sudden food shortage in the early 1900's when the Newfoundland caribou population drastically dropped from as many as 120,000 to as few as 5,000-6,000. The last wild wolf on the island was shot by 1911. However, it wasn't until 1930 that it was officially listed as extinct.